BioShock Infinite has gone gold after five years in development. To celebrate the guys at Irrational Games have broken open the champagne and also, for the eagerly awaiting fans, a new game trailer video has been released on YouTube entitled the “Lamb of Columbia” trailer. The Irrational Team sound like they are very proud of the game, not much more than a month from release. Ken Levine said “Nobody has ever built a game quite like this. It’s a shooter, but a shooter that brings you to very uncomfortable and dangerous places. I can’t demand that you play the game; I can promise you, however, that once you have, it will be an experience you won’t soon forget.” That does sound promising. 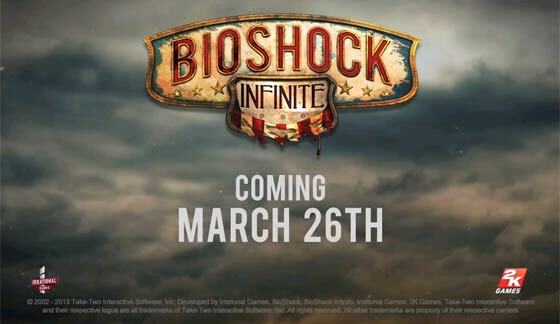 The new game will be available on 26th of March on Xbox 360, PS3 and PC. If you are a PC owner who is looking to upgrade their graphics card you might not even have to buy the game, it is free as part of all of the recently announced AMD Never Settle: Reloaded bundles (which require the purchase of an AMD HD 7800 series or better graphics card from a participating dealer). I dont want to wait till the end of march! It's only now struck me that Elizabeth looks very much like Alice in Alice Madness Returns. This trailer just dampened my interest in the game. Based on the previous trailers I thought “hey, that might be a game with some outdoors and sunshine” and this one just turned the lights off. Dark game with dark graphics, not interested. I get what you are saying, though given the previous vids I'm assuming there are some outdoor and some indoor sections. The problem is that when portraying a dystopian future, games always seem to end up as ‘washed out’ (a la Fallout) or dark n' dingy, but then, if it was all happy shiny sunshine and green/flowering meadows where the ponies and unicorns ran free, it wouldn't fit what most people expect from a dystopian future. Nothing a little thought about the plot (I'm thinking Alan Wake or the deserted planet from Firefly here) couldn't fix, if they could get the balance right.